If you are looking for the very best catering, you have come to the right place! Ponderosa Steakhouse Catering offers the best quality catering services for business meetings, parties, weddings, funerals, baby showers, bridal showers, sports banquets, special events, holidays, and more at affordable prices to the entire area. We take pride in delighting your guests with top quality food and catering services while still meeting your budget. Simply stated, Ponderosa Steakhouse Catering provides clients with outstanding quality, great pricing, and superior customer service. Catering services include pick up, delivery catering, delivery catering with set-up, or delivery catering with service staff. We can provide buffet catering for nearly any size group. Learn more about our menu. For catering questions or to book an event, call 812-257-0090. Whether we are delivering catering for a small business meeting or developing a larger event with staffing, we will make it easy on you. Corporate events are always challenging because it is difficult to make menu selections for guests. Let our knowledgeable and friendly staff help you coordinate all of the details. Corporate catering demands different styles of food service and Ponderosa Steakhouse proudly offers an amazing variety of options. 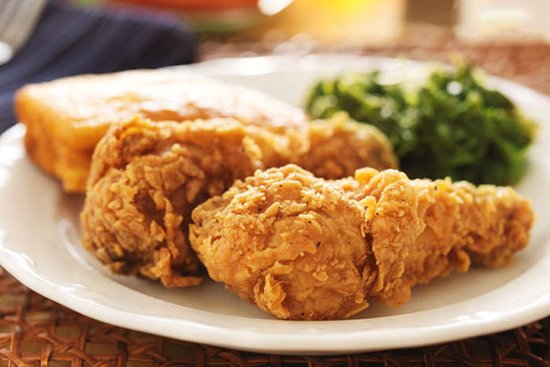 Ponderosa offers meals designed to meet the needs of any business. How about meal catering for several hundred guests? Don’t worry about it, we’ve got you covered! From corporate picnics to gala events to fundraisers, it’s all part of what we do. We provide corporate catering services all over southern Indiana and Illinois. We look forward to assisting with your catered breakfast, lunch, snack, or dinner and promise to make you feel like a guest at your next corporate catered event. Holiday catering can come in all shapes and sizes. Luckily, holiday catering is one of our specialties. Our clients rely on the incredible value and service we provide to make their holiday parties a success. Corporate holiday parties are a great way for guests to get their minds off work and enjoy the holiday celebration together. If you are planning a personal holiday party with your friends and family at home, we can provide traditional holiday catering menus so you don’t have to do any of the work. One call does it all when you connect with Ponderosa because you can depend on us to make your holiday party a success! Great buffet and you can get steaks any day of the week or weekend and you still get buffet with. Not to bad on price. We love it!! I have a large family so it's nice not to have to cook sometimes. Coming here is know we get good quality fresh food. It's always hot and we'll rotated. Come here every couple months just to switch it up. Restaurant is nice and spacious. Never too crowded which is nice. Food usually good. Excellent choice of foods and salads. Buffett is really.nice when I'm hungry as a beast and when I'm not the steaks are second to none. This is a nice place, I found it to be very clean, food was fresh and very good, staff was great. This place impressed me so much, I'd go back tomorrow if I lived closer. I've never been a big fan of ponderosa, but this one..... It was clean, well stocked, our waitress went above and beyond to make sure all 40 of the people on our group had drink refills. It was my grandfather in laws birthday, and I think he thoroughly enjoyed it, I know I did. Hostess and Servers were Super Pleasant and the buffet was clean, hot, fresh and REALLY Tasty!! Nice place to eat. Clean and plenty of space. The food was actually pretty good. I would recommend and I would eat there again. Wonderful employees, great food, and competitive prices. Sirloins are a little thin but the buffet made up for it. Always a pleasure to eat here. Stopped for lunch here today. Very clean and polite and pleasant staff. Waitress stayed on top of our table always removing dirty plates and keeping our glasses filled. Also the interior temperature was perfect! Sometimes restaurants are too cold, but here it was very pleasant. Food was fantastic also. Would definitely visit again. My favorite Ponderosa Steakhouse in Indiana, because of it's very clean, open atmosphere...in comparison to others. I personally like the Salmon best. Good place to eat. Good prices and good food. Nice clean atmosphere with friendly service. If your a trucker and want a good meal its a short walk across the parking lot from Chuckles. I will be stopping in every time I'm in the area staging out for a load or doing a 10 hour break. Great choices on the buffet and salad bar!! Got there towards end of the night, not much for pies left. Otherwise, great place! Great food at a very reasonable price, always clean and the server's our always super nice. ( Love that senior discount) ! Restaurant was nice and clean service was quick and friendly food is nice and hot today. Just an overall family atmosphere I would recommend it to anyone looking for a good family cooked meal. Great friendly service. Only issue was they had ribs on the buffet and the server was only able to give us one napkin per customer per the management. Don't see to many of them anymore. Was a great buffet. And the steak was amazing. It is clean and the food was fine. No difference between this ponderosa and any other. Yummy food and drink service was great. Love this place. Service is always with a smile. Very clean. Bathrooms especially. That says a lot. Food is excellent. I never miss a chance to stop here. Such a great place very friendly people and great food. Thank you everyone, had a great time. This is by far one of the better ponderosa's I've ate at! Always fresh food that's full. Staff is all nice also. And they have good prices with a special that's good everytime we go! Good food but not much to choose from if you don't eat pork or shellfish. Awesome place to stop for dinner while traveling with little kids. Love Love this place! I'm from MT. VERNON INDIANA so wish we had a Ponderosa Steakhouse closer to home. This place is always clean, nice workers and great atmosphere. They service is great and the buffet has decent food with several choices. The restaurant is clean and comfortable. Pretty good food and usually good service. One of the better places in Washington. We have always eaten at the Amish restaurant in Montgomery when we are up that way. We decided after our visit to the Ponderosa today that we prefer it over the Amish one. So we will definitely return. Thanks. Great place to eat .nice atmosphere and friendly people I would recommend this place to anyone..
Food options are large, salad bar is amazing. Very quiet and comfortable and location is right off of I-50 and easy to access! We come here every Sunday, had one bad experience with a rotten baked potatoe but they made good on it, took care of it nicely and the manager was great. This will not keep us from coming back, the food is good and steaks are yummy. It is best to go early in the mealtime. Good variety and choices on the buffet. Nice banquet room for large groups. Food is respectable for a buffet. Meat is about average for this kind of restaurant, although the hot bar and desert bar are outstanding! All in all....good food for a decent price. I would recommend it! The best buffet I've ever had. Not the biggest though. Very friendly staff. We had a great experience here! Wait staff were excellent and the food was perfect. It was a great way to spend Valentine's day! Service was slow and food wasn't cooked right when we visited recently. However the manager/owners were there and they gave us our food for free and a gift card for $60 so can't complain. When we used the gift card on our next visit the food was great and so was the food! The food, and service is great! The restaurant was very clean, and cozy. I love the wide variety on the buffet. We ( 23) had a birthday party to celebrate my Dad's 88th birthday there in the dining room area. The server & service was excellent! When at lunchtime. Fried chicken was hot, instant mashed potatoes were runny, rolls looked burnt. Desserts were good. Fried chicken livers were few and well done to a crispy texture. Pleasantly surprised after boycotting for years. Food quality on buffet excellent. The steak quality hasn't changed through the years. Still a $2 value add on. Waitress was extremely polite and helpful food was excellent and the choices were almost too numerous to say. I will suggest this place to anyone. Price was reasonable considering all the food that a person could eat. I just loved their smoked wings, I couldn't get enough. I was not a fan of staff just standing at the door as if they had nothing better to do, we felt uncomfortable as if we were watched during our meal, very unsettling feeling when you are eating, so we had to move seating. Food is delicious, staff is friendly, just wish it wasn't so uncomfortable with them standing there. Definitely will be returning for The wings!!! Very nice. The buffet is always fresh and full. Staff is there whenever needed. Great place to eat. Buffet was good and so was my steak. And it's not to expensive either. I wish I could eat here more often but I dont live in same town, I wish they would not have closed all of the Ponderosas around my town. Everything was fresh and there was a good variety of main dishes and desserts. Our server was very nice, kept the table clear and drinks full. I've eaten here several times, and the food is always hot and delicious. The staff is attentive and the restaurant is clean. There is an occasional wait to seated, but it is usually very short. I ate from the buffet bar and everything I had was fresh. Decent selection of food available. Salad bar and dessert bar had a variety of offerings. Wait staff was attentive. Ponderosa is Absolutely the Best Place to Eat! I wish we had one in our town! We use to when I was younger...It was even better than I remember. Super Clean! Food was Hot! Lots of Good Choices! This is the second one I've been to. Each one is a little different in their own ways. This one has more dishes that are spicy. Spicy shrimp and spicy fish spicy chicken. There dessert options are different as well. I expected more for what I paid for lunch. Love the food, tasty and fresh. Clean dining area and friendly service. The food is soooo gooood! I hadn't had such good food in a long time! It's a nice, homey atmosphere, and the workers were kind. Would definitely go again if I lived closer! Great food and service. We go a couple of times a month. I just wish they had more low sugar desserts for diabetics like a variety of fresh fruits. Great server. The steak was actually full of flavor and was on our table in record time. Reason was, it was almost raw. Sent both back, second time a charm. Done perfectly with juices retained. Good job Ponderosa. Unusual to see shrimp on a buffet. They had butterfly shrimp and spicy popcorn shrimp. Both were quite flavorful. Three soups and a decent salad selection. A separate hot bar with chicken, meatloaf and kielbasa. Mashed potatoes were instant; which was a disappointment. Overall, a good buffet that they kept fresh. Good flavor to everything. Several sweet choices; including cookies, brownies, pies, and cake. Ice cream was also available. Had a moist brownie and a dish of ice cream. The food was very good and the facility was clean. Always stop there on way to Louisville. Waitresses are great! Ponderosa Steakhouse has been around for as long as I can remember. My gripe with this place is that their prices are pretty damn high when it comes to their buffet. I will say, however, that they have a wide variety of discounts to help alleviate the price. The buffet variety is pretty good, and the help there has never let me down. In fact, I'd say the service at this place may very well be the best in town due to some solid experiences with them in the past. Give this place a try if you're ever comin' through. Great place to eat. Attentive server and the food on the buffet was fresh. The only downside was the depressing country music. A little more variety there would get them 5 stars from me. Good atmosphere, good food, great service! We had a group of 20 and the drink service was phenomenal and the buffet never ran out of food. Good food. Nice Waiters. Clean. Good for large crowds. They have a variety of salad fixings, hot food, and desserts.If you don't like buffet, they also have steaks, baked potatoes, and shrimp along with the buffet and salad and soup bar and dessert bars. Food on the buffet was very fresh and the steak and baked potato was delicious. Restaurant was very clean and our waitress was very nice. Good service. Fresh,food regardless of time of day. Excellent quality control and personal,touch by staff and management! Buffet had a good selection. Food was well presented. Wide variety of desserts. Service was polite and perfectly attentive. Clean. Friendly service. A nice lunch buffet with numerous choices. $1.00 off for 62 and older. Highly recommend. Even though it is a buffet style restaurant you can order other items. The waitress were very attentive and constantly ensuring you had what you wanted. We live in Terre Haute, Indiana and had to drive here to Vincennes to come eat..we used to have 2 Ponderosa restaurants in Terre Haute, but they closed them down a few yrs ago and we miss the food.. I've only eaten the buffet. It would never be worth my while to try to eat an entre' and the buffet because there is always so many wonderful choices on the buffet itself. The banana pudding is as good as my mom used to make. Subscribe to our email list to receive coupons and promotions from Ponderosa Steakhouse. Have a great time at your local Ponderosa? Share your experience with our community on Facebook. See what others are saying about us, or rate us and share your experience at your local Ponderosa. Would you like a great job in an awesome family environment that’s clean, comfortable, safe, and fun? Apply today!